Last week we had published the full tutorial and guide to Tethered Jailbreak iOS 6 beta with Redsn0w for iPhone 4, iPhone 3GS and iPod 4G Touch A4 devices with the limited access and integration of SSH and afc2 support only on iOS devices and it doesn’t included the integration of any GUI tools like Cydia and others jailbroken apps, but luckily now iOS 6 beta firmware device users can Install Cydia on Apple iPhone 4, iPhone 3GS and iPod 4G Touch with easy integration steps and procedure. Yes you have heard it correct it’s now possible to Install Cydia on iOS 6 beta running devices including iPhone 4, iPhone 3GS and iPod 4G Touch. Installation of Cydia on iPhone, iPad and iPod Touch requires Jailbroken iOS 6 Firmware so if you haven't Jailbreak your iOS 6 beta firmware, you will need to do it before the installation of Cydia. Click here and follow the steps and procedure to Jailbreak iOS 6 beta firmware on iPhone, iPad and iPod Touch device, which helps you to easily install Cydia on iOS 6 beta firmware. A very well-known iOS developer and hacker named "WyndWarrior" also known as "Andrew Liu" has discovered the installation of the recompiled version of the Cydia on your iPhones, iPad and iPods running on the iOS 6 Beta. Now let’s start the Tutorial and Guidelines to Install Cydia on Jailbroken iOS 6 beta Firmware for iPhone 4, iPhone 3GS, iPod 4G Touch and other A4 Chipset Devices. Just follow the following simple steps and guidelines to Install Cydia on Jailbroken iOS 6 beta Firmware for iPhone, iPad and iPod. How to Install Cydia on Jailbroken iOS 6 beta Firmware for iPhone, iPad and iPod? Download the tool package provided above and then follow the following simple steps to Install Cydia on Jailbroken iOS 6 beta Firmware for iPhone 4, iPhone 3GS, iPod 4G Touch and other A4 Chipset Devices. Step 4: Once the above command is carried out, the installation of Cydia should begin on your device and the Cydia icon should appear on the SpringBoard or the Home screen. If due to some reason that doesn’t happen, one needs to reboot and get it boot tethered using Redsn0w 0.9.13dev1. Step 5: Now tap the Cydia icon appearing on the springboard and wait until it finishes preparing the file system. That’s it then; you have successfully installed Cydia on your iPhone, iPod Touch or iPad running the iOS 6 Beta 1 firmware. Congratulations!! 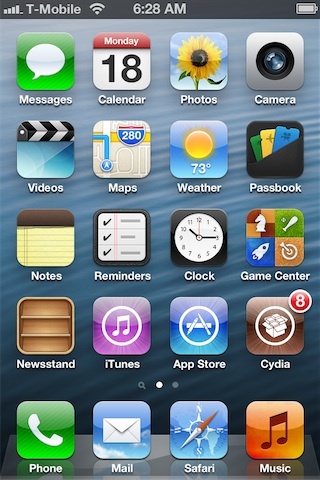 You have successfully Installed Cydia on Jailbroken iOS 6 beta firmware running on your iPhone, iPad and iPod device. Note: iOS 6 beta device users need to know that even though you have successfully Cydia installed on your idevice running iOS 6 beta firmware, a majority of Cydia tweaks will not work. This is because they need to be updated for iOS 6 compatibility. So Install and Proceed at your own risk and if you face any problem, let me know in the comments box below.